I’m going to get a team together so that all aspects of the campaign from writing, to branding, to technical aspects are in place to make the best experience possible for players. I’ve added a section in the forums. Anyone wanting to see what progress is being made, or who wants to volunteer in some way, please visit that section of the forums. For those of you who don’t know what I mean by a living campaign, here is the introduction from the forum. 1) What is a living campaign? 2) But Myth isn’t an RPG. How would this work? Although Myth isn’t an RPG, it shares character advancement concepts with role playing games. The idea would be that a player could play through common sets of scenarios, track their character’s advancement, and take that character to play with other characters whether it is at a convention, a game day, with another group of players at home, or even online, if a feasible online tool is in place. Basically, by tracking the titles, items, and card swaps of your character and advancing on the same track, you should fit right in with other players and characters. 3) How would I track my character? Each character would keep a character tracking sheet that tracks which adventures/stories they have completed, and what rewards they received for that adventure. Rewards can include experience, titles, items, promotions (to journeyman),gold, serendipity, and card swaps. Each quest would have specific rewards, in addition to rewards earned for accomplishing a certain number of quests. 4) How would advancement work? At the end of each quest, each character would receive 1 experience (or whatever we end up calling that metric). In addition a quest can reward other resources that carry over from quest to quest, and/or unlock certain items that the character can add to their character (if they have the ability to keep an item.) As the character accumulates more experience, they can unlock further abilities like titles, keeping items, or card swaps. The idea is that characters who have completed 5 quests should be about even in power no matter what table they played at, and it would eliminate some of the luck from drawing a good item. 5) How do I know if my character is appropriate to a certain quest? Each quest will be rated with an experience range. Characters outside this range would be unable to play the quest. Borrowing from Pathfinder Society, it is likely each quest would have a high and low tier, allowing a couple different level ranges experience the same storyline with appropriate challenges in place. How often would I play? The initial plan would be to publish 6-12 “modules” per year, depending on how many writers got involved, and how much editing is needed to get each module out the door and get it play tested. Players could play as little or as often as they’d like. A player could play the same quest multiple times, although a single character could only do a quest once. By using multiple characters, a player can play more times than there are modules available. Can I use my living campaign character outside the campaign? You are welcome to use the character for whatever games you want, but only campaign games would result in advancement of your character. You would receive no experience or other advantages from the non-campaign games. Why would we even want a living campaign system? By having a living campaign system, it will allow the creation of events and campaigns, with players supplying their own characters from their own gaming groups. For example, a kraken event at gencon could be run by supplying each player with a pregenerated character, but wouldn’t it be more fun if each player were able to arrive with their own character that they have been playing over time, with the development they have put into the character? As the number of Myth players grows, this is a way to get a shared experience with other players from around the world. Agents are an items that sounded great in concept, but really didn’t seem to fill their potential once they hit the table. They were supposed to be special mini-bosses that would show up and harass the heroes at inopportune times and become recurring foes. However, there were really no mechanics that made that happen. This is being fixed with Myth 2.0. We know that agents will be getting new quests via the Journeyman kickstarter, and we know they will be getting new cards via the 2.0 monster cards. It’s also been stated that a mechanic for recurring will be put into place. Last August, a Myth fan on Board Game Geeks called Mistermannindy approached how to fix agents and make them. There were some excellent concepts there, which I’d like to expand on (steal ideas from) before the new agent rules are set in stone. The original discussion was about how to create a home grown agent that better fit the agent concept, but I’d like to focus the discussion on making Agents live up to their potential altogether. The original BGG discussion can be found here, along with some example cards by Mistermannindy. There are several key mechanics that should be addressed with agents. How do the heroes meet an agent for the first time? Under the current rules, agents are a type of miniboss, so any time a miniboss should be placed, an agent could be placed. This basically comes down to certain threat penalty events in darkness decks. Myth 2.0 already is introducing minibosses a a standard part of certain types of tiles, giving yet another way to first find an agent. This is being addressed in a third way with the new agent quest cards coming out with the journeyman kickstarter. The combination of these three methods should give plenty of opportunities to introduce agents into gameplay. I personally feel the third method should be the way agents get “unlocked” however. Much like you can’t get the help of allies until you unlock them, I believe agents should not show up as random minibosses until after their first quest has been completed. However, I think that the miniboss mechanics are very important for reintroducing a particular agent, especially if their quest chain is complete, and nobody has their card. Get a parting shot. This parting shot is what would vary from agent to agent. Perhaps they unleash some minions or captains on the party to cover their escape. Perhaps they leave behind a trap, cackling about how the heroes will never escape their doom. Perhaps they steal an item or gold on their way out, further infuriating the party. Or maybe they cast a spell or drop a “bomb” as they go, doing damage to everyone in a certain radius, or causing a debuff in place of damage. The key is to give each agent an exit that is memorable, unique, and that the heroes don’t want to happen again. Immediately draw the next darkness card and resolve it as normal. Fate Dice Method 2 – Roll 1 fate die for each agent that corresponds with an agent card in any player’s deck. On the result of a darkness symbol, that agent will appear on the map. If darkness symbols comes up for more than 1 agent, then each indicated agent will appear. 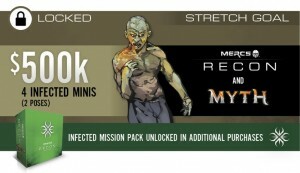 D10 Method 1 – Each agent will need to have a number for appearance added to their monster card. This will work the same as Fate Dice Method 1, except that a d10 is used and agents are numbered 1 to 10, giving a 10% chance of appearance instead of a 17% chance of appearance. D10 Method 2 – An agent tracker sheet will be filled out before the start of a game (or held over from previous games.) The Agent tracker sheet will have the numbers 1 to 10 on it. Each agent associated with a card in a player deck must be assigned to a slot on the tracker sheet by assigning a number. Multiple agents can be assigned to the same number, or agents can be spread out, depending on player choice. When the agent card comes up in the darkness deck, a d10 will be rolled and all agents in that slot will be activated. I believe addressing this area will make agents much more memorable villains, who live up to their promise and create great stories. They would be different than other minibosses, and give more of an epic feel to them as the eternal foes of the heroes. Now that monster cards will be double sided to get more real estate, I think there is plenty of room to make this work. Agents don’t necessarily need to physically attack the heroes to create trouble for them. They can set traps ambushes, or generally create havoc for the heroes. Here is a way to change the mechanics of the two fate die methods to add this aspect to agents. Fate Die Method 2: In addition to darkness having an agent appear, they could have 1 or 2 symbols assigned to harrassment effects. 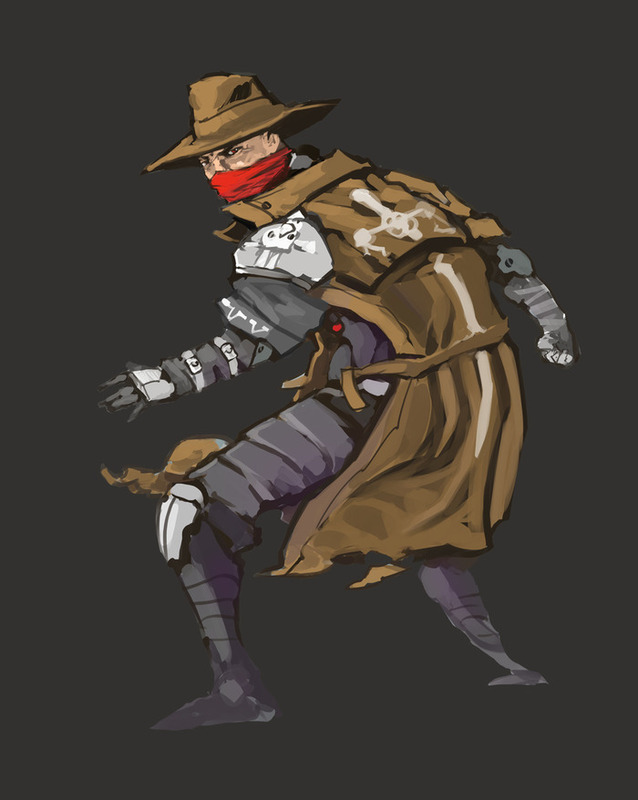 For example one agent might sneak away with some party gold on a guile role, and throw an explosive at the person with their item on a rage roll. There are basically two types of challenges in Myth, traps and combat. There is a little variation on traps, and a lot of variation on monster types and combinations for combat. However, everything still comes down to just a couple of mechanics. With the introduction of journeyman, and even more-so, with the release of Myth 2.0 rules, I feel Myth has still missed the opportunity to give more of a variety of challenges. Simple things like swimming, climbing, and jumping can enhance combats, creating advantages and disadvantages. What about the opportunity to talk your way past someone? Translate some runes? Push aside a boulder? There are a lot of different things that can be simplified to a non-combat test, but which would be greatly enhanced if there was variability between the heroes. The apprentice is likely the guy to call for those runes, but he probably isn’t quite as good at climbing and swimming as the soldier. Shadows of Brimstone is my biggest comparison. I don’t think a system that diverse was needed, but some middle ground would have been nice to give more variety in quest building. First, let me say that more game modes to get the most out of myth materials is always a good thing, so I give credit there. However, I think barfight failed to capture the essense of Myth like Slaughterfield did in the previous campaign. It’s a very simplified system and lots of die rolling, but other than using Myth miniatures and tiles, nothing about it screamed “Myth” to me. The characters pretty much become clones of each other, and seem to not have much more impact on the game than what token you select when playing monopoly. It completely abandons the card system, item system, etc. I’m hoping some revisions are made to it before it goes live, or someone has inspiration hit on the fan side of things. I like the idea of the bar fight, but the game mode as it stands just didn’t grab me. Advanced Title Expansion – I think titles easily could have been their own add-on for the game. I personally like the idea of title trees, allowing for lower tier titles to be prereqs for mid tier titles which are in turn prereqs for upper tier titles. Right now there are stronger and weaker titles, and having tiers would help balance that out by making heroes work harder for the stronger titles. (Having the right prereqs adds more story and accomplishment to titles.) I’d also like to see better rules for keeping items and their connection to titles being addressed. Mixed with the title tiers, you could easily allow white items (potions) to be kept with tier 1 titles, green items for tier 2, blue for tier 3, and orange for tier 4. Alternately, a point system could be in place (example: 1 title =1 white, 2 titles = 1 green, 5 titles = 1 blue, 11 titles = 1 orange). I’m sure more titles will be available in mods, but those will be piecemeal. I think more structure and a closer look at the balance is as important as quantity of titles. Titles could be used to tell stories of their own, and right now I think that is missed. Random Tile cards – A lot of players are looking for less decisions made by the players. Having cards for all the tiles in order to randomize what the next tile is would have been a win for many. Hunting Pack Deck – Now that chapter quests are going away, I’d have liked to have seen random “events” happen with hunting packs. Have defined numbers, defined races. Perhaps something to make some of the packs unique. I could see this as a table to roll on as well (which I will probably end up doing here), but cards are a more expandable solution. Once again, this is more support for those players wanting the game to make the decisions and not the players. Myth Stickers – Yes, this isn’t a gameplay item, but it could have been nice for storage. Labels and artwork to put on miniatures cases and such to mark what’s in each case would have been another low cost, but very usable component. The armored carapace of these crawlers is harder than normal. TN +1 to hit this creature. These crawlers attack much more fiercely than is typical of their kind. Roll +1d10 on all attacks. These creatures act more intelligently in numbers. Roll 1 FD before moving any creatures of this type. On a darkness roll, treat them as intelligent instead of instinct for the turn. Add 1 FD each time this ability is added. This creature’s coloring blends with the surroundings. This creature is hidden in shadows. It can not be targetted at range, and requires a TN 4 check to see each time a hero tries to attack it. (Failure counts as a miss.) Increase the TN by +1 each time this ability is added after the first. This creature is faster than most of it’s kind. The venom of this creature is extra deadly. Roll +1 FD for the poison skill. Cave Grubbers are experts at ambushing their enemies. Cave Grubbers are always considered a shadow spawn. When placed for a lair or a patrol, they should be placed adjacent to heroes according to priority instead of adjacent to the lair or in the normal setup zone. Cave Grubbers live in the darkness, and have developed a closer connection to it. During the refresh phase, the AP meter advances one more than normal while a cave grubber is on the current tile. Mountain grubbers are tougher than others of their kind. Mountain Grubbers have 2 vitality and roll 2d10 to hit with their crude weapons. Swamp Grubbers rub various mushrooms on the spikes of their clubs causing a dazing effect. Heroes hit by a Swamp Grubber get +1 to all TN numbers for combat and non-combat actions during their next hero phase. Multiple hits don’t stack. These of course are just examples. Some are stronger than others and even stronger versions might be better. Alternate lairs – lair upgrades can be handled just like minions. Perhaps a lair has built in defenses, like being surrounded in a deadly gas (working like an ill-fated spawn each time there is a spawn), or oozing acid to damage each adjacent hero, or having more vitality than normal. A lair could have a different spawn that replaces all “normal” spawns. Maybe it creates shadow spawns so the minions constantly ambush adventurers, or automatically use heavy spawns. Perhaps it double spawns every darkness cycle. 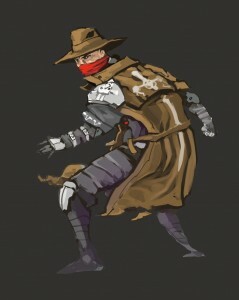 They could have these as constant abilities, or they could use fate recipes with each spawn to make the modifications. My last hope for this one is that modules will include rules along these lines, which would leave only a couple races that aren’t addressed. If that opportunity to add in these low cost, high versatility options passes, then I don’t think there is another crack at official rules until 2017/18 with a Master campaign. I do realize some races will have some upgrades coming with commanders, but I think commanders are only a partial fix. I believe 1 or all of the changes above would get much more mileage out of races, especially core races. There were a lot of things to be excited about with the Myth Journeyman campaign. Here are ten items that I found to be key additions that will take Myth play to another level in 2016. Part of the draw of Myth is what a beautiful game it is on the table. The miniatures add a lot to the game. I always disliked putting counters on the table for allies and summons. That won’t be a problem anymore. Key non-player characters Father Josh, Father Andrew, and Lucy have joined Marcus the Ready in miniature form to replace counters. It doesn’t add any new rules or game-play options, but for many players (like me) it enriches the game experience every time you place a miniature on the table instead of a counter. The additional quest packs and the item pack weren’t the flashiest added items during the first campaign, but they were one of the most used add-ons, and give more variety to game-play. With that in mind, I certainly welcome 2 more item packs and another quest pack into the mix, and especially look forward to seeing how the quests run with the new formatting for Myth 2.0. More items in the mix is huge for me, since I like to design pregen characters for conventions, and the more items in the game, the more options I have to make each and every hero unique in their play styles. This item didn’t get much fanfare since it was grouped with the much more visible thieves guild captains, but I’m really intrigued by the changes coming for agents. Agents will have their own quest lines added for adventure play as well as new rules for Agents randomly showing up to harass the heroes. I think the added continuity will help differentiate agents from minibosses and other enemies, giving another great tool for creating memorable stories. Eight new monster races are being added to the game, more than doubling the available pool of enemies. This gives us 15 races in all, with six from the original campaign and one from the recon kickstarter. The new races add a variety of mechanics, including the gooples, whose acidic ooze can damage weapons used against them, and thieves who will steal your gold and equipment right out of your inventory. Every race looks like it will bring something new to the game, so your adventures should never get stale. If you play a weekly game of myth, and base each week around an enemy race, each race would only hit the table two to three times a year, keeping them all fresh. Another subtle stretch goal that got bundled with another stretch, the epic bosses excite me for two reasons. First, it keeps some of the lower level bosses challenging as the heroes advance with their new journeyman powers. That in itself is good for the game. However, I also see this as a great sign for the game long term. As much as there is focus on new enemies and new challenges, MegaCon Games has not forgotten the content already there, and is willing to update and expand it to keep it relevant. For players coming into the game in the future, this means that by making some smart buying decisions, you can get into even high level play at an affordable price point, which is key for continuing to grow the fan base. 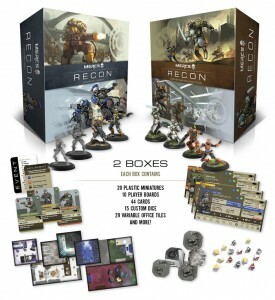 Modules were introduced with the Recon Kickstarter, and I was very happy to see them migrated over to Myth. Modules give a style of play that many players have wanted, with a series of storylines that have pre-defined quests. Instead of players making decisions on what kinds of enemies and traps lay before them, the quests have all the set up instructions built in, from tiles, to monsters, to lairs, to traps. This mode of play is a departure from the original vision of Myth, but it gives a play option much more in line with the expectations of players used to other dungeon crawlers. With the main set quests going into module form, the two expansion boxes, the free stretch modules, and the add-on modules, we’ll be hitting the ground running with thirteen modules in print, which should keep players busy for quite some time, even without any fan content. One of the key things that modules introduce is Commanders. This is a new level of enemies, with a difficulty in between captains and bosses. Twelve different races include commanders, giving new challenges to put before your heroes. Commanders range from direct threats that attack the heroes, to buffers that make minions and captains stronger, to debuffers that cause complications for the hero and reduce their effectiveness. This will breath some more life into some of the older races while at the same time bringing in even more variety of experiences with the new races. While technically not a part of the journeyman expansions, this initiative is closely tied to the new material. While most of the changes are simply cleanup and formatting to make the rules easier to consume, there are some key changes coming through the rules to help give a better game experience as well. MCG has shown a lot of commitment to listening to the fans when it comes to improving the game system, and I believe when the 2.0 rules and cards come out this September, it will make it easier than ever to get new players interested in the game. Of course the focus of the new campaign was the journeyman heroes themselves. Journeyman rules were talked about during the first campaign, and now they will become reality, with upgraded statistics and 10 new cards for each journeyman path. The five original heroes will each have two paths to expand with, while all other heroes will have a single path. Journeyman will allow even more customization of every hero, which is exciting for me when designing pregens. Heroes will be equipped to take on greater challenges, with new abilities…which means the ability to use more of the enemy content without almost certain death for the heroes as well. There is a lot to be excited about in the future of Myth, with content hitting three times in the next fifteen months. It’s a good time to be a Myth fan. Myth Journeyman is in it’s final sprint. This expansion to Myth takes the game to another level with new character types, new monsters, Myth 2.0 rules, and of course journeyman advancement paths. Expecting great things from it, and can’t wait to see where it goes. 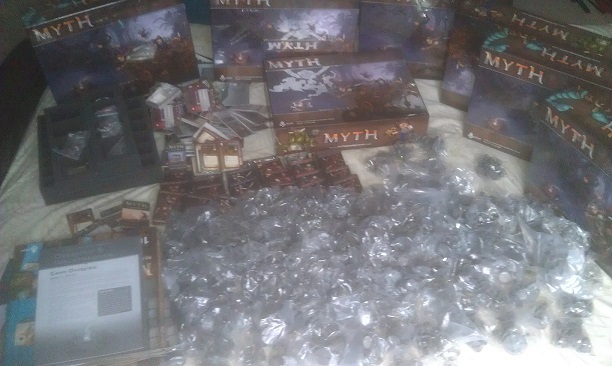 Within a few weeks I received my second shipment of Myth (actually, my shipment, my wife’s shipment, and my son’s shipment) and several other games. At almost the same time, Xia arrived at the door. A couple weeks later, my wife got her copies of Shadows of Brimstone. (My son and I are still waiting on our sets.) During this period, I’ve also changed jobs with a ton of time devoted to work (including nights and weekends). As a result, I haven’t gotten to spend the time I’d like to on board games. Xia hasn’t gotten opened yet, and I finally got my Myth sets unboxed, although they haven’t been sorted. 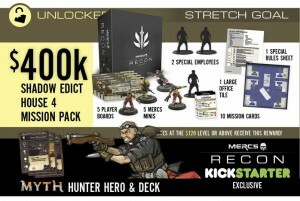 We are in the final week of the Mercs Recon Kickstarter, ending the morning of April 18 CDT. I don’t usually post a lot about other games on here, but this game is very important to Myth players and collectors due to the number of crossovers. 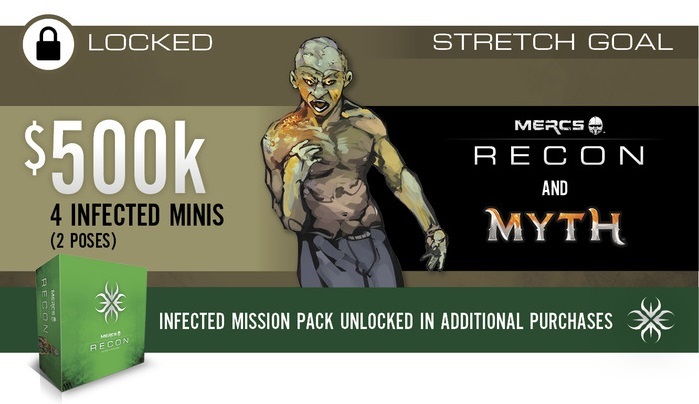 At the time of this writing, there are two Myth stretch goals unlocked, and the campaign is closing in on a third. MegaCon Games has promised further Myth goals to come this week. 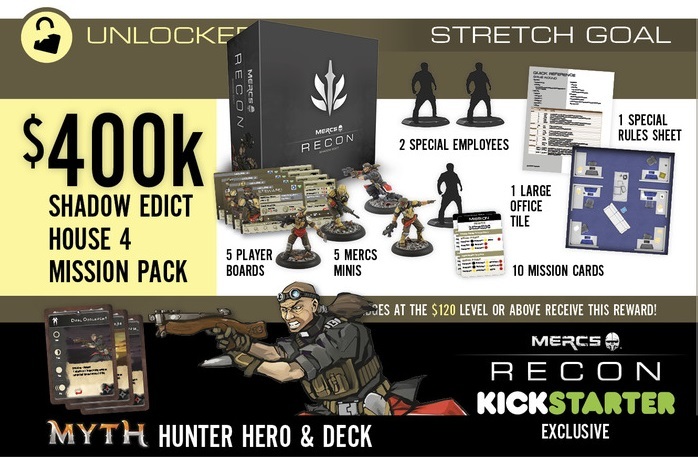 All Myth goals are included in the Agent ($120) and Opfor ($200) pledges, and for those just looking to keep up with Myth without adding another game (or 3!) there is a Myth only pledge at $40. The first Myth crossover was an additional agent. For those who don’t remember agents from the original Myth campaign, agents are similar to minibosses, except they are recurring enemies that will hound the heroes from adventure to adventure. “In Myth, he is an Agent class Darkness monster named Inquisitor Alger. He pesters the Heroes from a distance, with an attack called Confessor’s Call that doesn’t damage but increases the Hero he hits Threat. “The Hunter is a hybrid ranged/melee Hero. He does NOT share the Archer’s LOS special ability. His deck mechanic is pretty cool. He plays Ongoing “mark” cards. If the Hunter kills the mark the mini is placed on the card and he receives big attack bonuses to killing the same monster-types. He can double up his bonus with another mark card. Regardless, when the Hunter marks a monster-type, other monster-types have bonuses to hurt him. The Hunter can dump the Ongoing card like the Apprentice. As he grows into Journeyman and beyond, he can mark more than one monster-type. MegaCon has already said more Myth goals to come. This kickstarter is ahead of where Myth was at the same time. Should be a wild ride, hopefully with a lot more Myth additions to come, shaping the next step of the game, and giving an idea of what will come for the game in the future. There have been a lot of great discussions and postings on the forums of this site, from rules questions, to posts from Mercs, to just casual discussion. However, there is one post in particular that I want to highlight, especially with Myth shipping out this week. 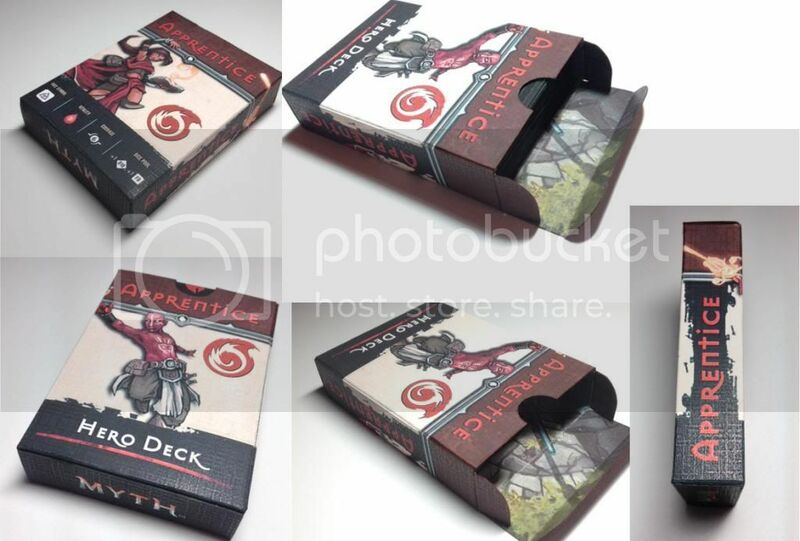 CarelessOpossum has given us sample pictures in addition to the print files to make your own for boxes to hold all of your Myth Cards. They are sized perfectly to keep all your characters separated, even having enough room for your items each character is carrying. In addition there are card boxes for the darkness, items, and slaughterfield. Like many others out there, I’ll be doing a set myself, and I really want to make sure that CarelessOpossum’s excellent home made accessory to the game gets all the press it deserves. May through January seemed to go by in a Flash. Then the last two months have seemed like such a long wait. We can definitely see the light at the end of the tunnel now. It was great seeing cases and cases of Myth delivered to the warehouse last week, and the update today that 300 orders have been process and will ship out today was a great follow-up to that. With the estimated rate of 400-500 orders processed per day, it means that all US orders should be out the door by the end of next week. Here is to hoping that players around the world will be playing Myth by the end of the month. From my side, I’ve got a few local games planned, introducing the local board game club to the game and getting the chance to play with family. Unfortunately we missed the local convention schedule, but I’m now confirmed to be at GenCon, although I’m going for a less ambitious schedule for this year with the late start on things. It’s been almost 9 months since the end of the Myth kickstarter, which also makes it 9 months that this site has been up. I wanted to reflect a little bit on this Myth website in the period before Myth has even come out. We’ve had over 1100 users sign up, and are approaching 8000 posts. I have to say both those numbers are far beyond where I’d have imagined them when I decided I needed to get some forums up. Evidently Heroquest is still in people’s minds. A thread about HeroQuest and Advanced HeroQuest was the most read, with over 40,000!!! hits. The most popular thread among Myth topics was Duncan’s Trickster Pledge Mini-Boss. That was probably helped quite a bit by Duncan actually being an active participant, so I can’t thank him enough. The next most popular was actually Questions for MERCS, which also got help by appearances from the MERCS team, who I also can’t thank enough for their support. Once Myth clears customs, this place should explode. Game play. Rules discussions. Stories. I expect to see things get even more busy around here. Contests – Voting for the first contest is underway at http://www.landsofmyth.com/Forum/index.php?topic=572.msg7829#msg7829. Pick your favorite captions, to help someone win some additional Myth miniatures. More contests will come in the future. Mythwiki.org – I’ve registered Mythwiki.org, and have been getting things going. Hopefully I can get a lot done for it while on planes the next couple weeks, and the work in progress can be found at www.landsofmyth/wiki/. I hope that this will make for an easy way for people to access game information from rules to storylines, etc. This is a big project, and although I hope to do a lot of the work, I hope some of the fans out there will become contributors as well to make the wiki the most complete place to get Myth information.